On Monday evening I was feeling a little low. No reason for it; I had handed in a particularly tricky and probably crap essay, it was the first day of the spring term at university and I’d had a late lunch with a friend. Great day right? Well, you’d think so but obviously my brain didn’t. As the evening wore on I’d started to feel a little down and lonely which is bizarre as nothing had changed from my normal evening routine and, living alone doesn’t mean I feel lonely but on this evening I did. I posted a status on Facebook saying that I was feeling a little down and asked people to make me smile. This is when knowing that you have amazing friends is brilliant. Two jokes (clean ones!) were posted onto my status along with a couple of funny pictures and some cheery comments, I instantly felt better and less lonely. I have been thinking about this a lot lately as I have been blessed with some great friends, some of which were a subject of a post I made about being thankful for http://wp.me/p1Hi8a-d3 and do see several people most days so finding myself feeling lonely was a shock. Add this into a month off university for the Christmas break and I sat wondering why I didn’t feel lonely then when I was alone a lot and wasn’t bothered at all. I guess it shows that you really cannot control your brain or feelings but it also proves that any contact with others can help. For anyone who was worried about me, I am sorry, that was not my intention but it was a time when I was low and needed picking up and my friends are fantastic at that! I am feeling better now, still a little low but I can deal with that, although if you have a joke you just need to share, think of me, I love jokes especially ones that make most people groan! Some of you who know me well will know that I am being treated for depression and anxiety, both mental health issues. I also have a slipped disc in my neck but that’s less of an issue to some point. Before you stop reading, this is not a pity post, far from it. My mental health problems started around the time I separated from my (now ex) husband, not that it was all because of that, I was also having a tough time at work. The combination of these two events took their toll on me and when I went to the GP after a few weeks of having a cold/virus I broke down in tears and gabbled my problems at him prompting him to sign me off work and prescribe anti depressants. Fast forward a year, I am divorced, living in a small but cosy flat, fostering a cat via a charity and studying Criminal Justice Studies part time at the University of Kent. Life is pretty good, I am in a new relationship with a previous partner however, I am still being treated for depression and beginning to struggle again. It takes me ages to recognise it this time and I eventually admit defeat and hide at home rather than going into University. Weeks become months and I miss a whole term. I eventually go to my GP who increases my medication and I am now on an even keel. This does take a bit of time but I do manage to sit the only exam I had for the year (and I pass!) and I start looking forward to the new academic year. Around this time, I also receive confirmation of my disabled students allowance which you can read about here. This helped shift my mood a lot and I started enjoying life a lot more. It seems a bit wrong to say that as someone who is depressed I shouldn’t be enjoying life, right? Wrong, just because my brain is a little bonkers at the moment doesn’t mean that I can’t have fun or even laugh at a great (or terrible) joke. 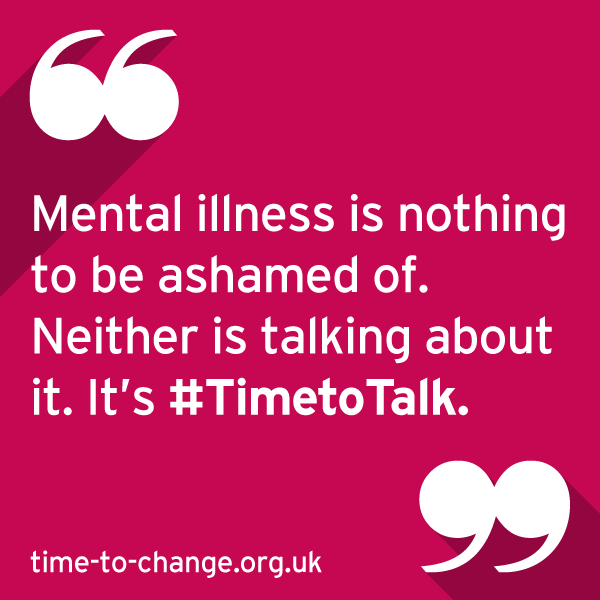 For the last few months, I have been following Time to Change on twitter and they have a campaign called Time to talk. The campaign is all about encouraging people to talk about mental health. I was born in the 70s when this was a hugely taboo subject and, having seen the looks of pity in some people’s eyes, I struggle to talk about it at times too. It is not easy to tell even your closest friends or family that your head is messed up, you’re starting to struggle again or you are just plain exhausted, fed up and worried you’ll never be yourself again. Luckily, I can talk to my mum and friends but try not to do that too much after all, who wants to hear me whinge all the time? Does a conversation with someone who has depression have to be about depression? Nope, call me and tell me what you had for breakfast or what you watched on telly last night. Send me a text or post a joke on my facebook wall, I will probably laugh and repost it or, if you follow me on twitter, tweet a cute kitten picture, I love those! As important as it is to start a conversation about your mental health issues, it is just as important to start a conversation with someone who has a mental health issue. In addition to this, look at the time to talk campaign and mention it to 1 other person and ask them to do the same. The further we get the word out there, the better.